This bowl has it all going on… a little savory, a little sweet, a little tangy… cooked veggies and raw, plus a while lot of CRUNCH! 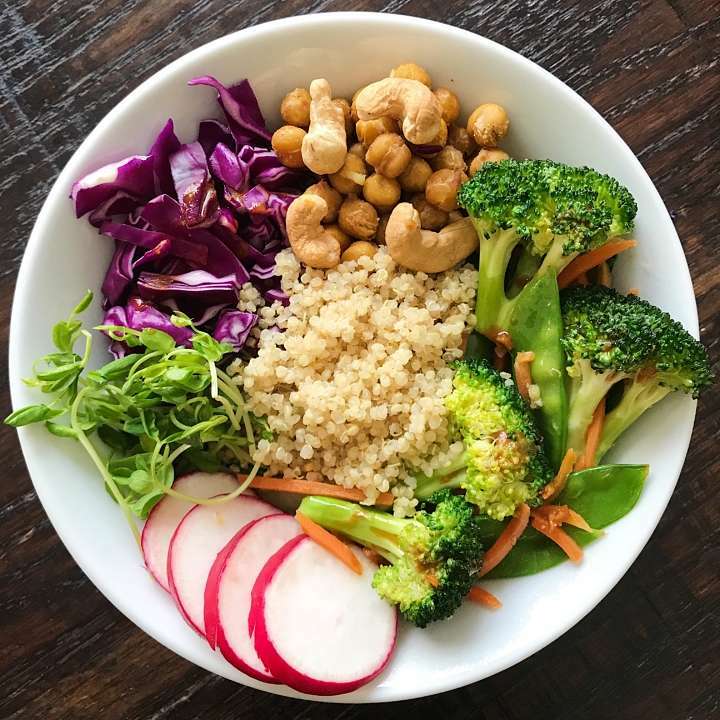 Recipe inspired by and adapted from The Veggie Chick, it’s Stir-fried broccoli, snow peas, and bok choy, quinoa, purple cabbage, radishes, crispy chickpeas, roasted cashews and pea shoots, served with the yummiest Asian Sweet & Tangy Dressing. The dressing deserves a little more attention because has the best flavor! It’s a combo of white miso, lemon juice, gluten-free tamari, rice wine vinegar, ginger, and honey and it is delicious! This bowl is great warm or cold and leftovers are great the next day. Warm or cold, this simple bowl with satisfy your senses and taste buds. A little savory, a little sweet, a little tangy....stir fried veggies and raw... and a whole lot of Crunch! Recipe inspired and adapted from The Veggie Chick. Preheat oven to 400 degrees. Gently toss chickpeas with a touch of avocado oil and kosher salt. Bake 15-20 minutes or until crisp. In a large skillet over medium-high heat, heat 1 tablespoon sesame oil. Add broccoli and cook for 3 minutes, stirring frequently. Add carrots and snow peas, cook an additional 3-5 minutes until tender-crisp. Cook longer for softer vegetables. Remove from heat and set aside. In the same skillet, heat second tablespoon of sesame oil over medium high heat. Add bok choy and saute for 5-7 minutes, until it wilted and tender. Cook longer for softer vegetables. Remove from heat and set aside. Whisk all ingredients together is a small bowl or liquid measuring cup until well combined. 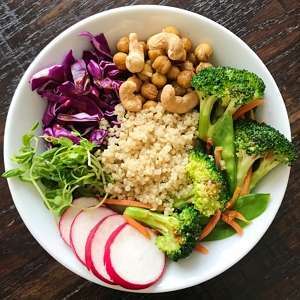 In a bowl, add a scoop of quinoa to the center then place around it the stir fried veggies, chickpeas, cabbage, radishes, pea shoots and cashews. Spoon dressing over bowl as desired.